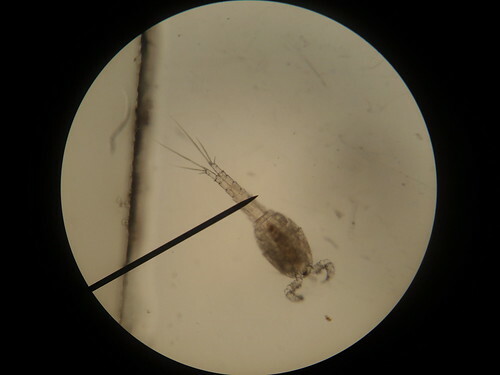 The copepods we have found seem to be something called Cyclops. A (the Rami) is too short and fat. B (the lateral setae) is in about the right place but is barely visible, and C (the inner setae) is so tiny it is almost invisible. The name Cyclops comes from the Cyclops of Greek mythology which shares the quality of having a single large eye, which may be either red or black in Cyclops. 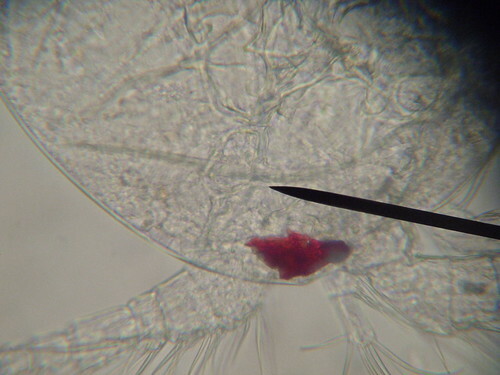 On ours the eye is red, and we've seen it on all the copepods we've looked at up close. 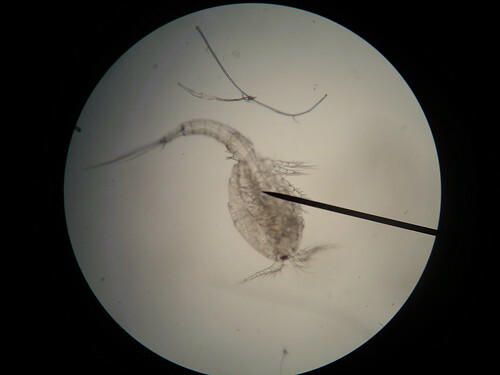 Also, in a previous post, I said we thought we had two species of copepods. But those to variations seem to be the male and female. Cyclops bicuspidus is sexually dimorphic. The males look like they have crab claws instead of antennae or sort of like the grabbing front legs of a water bug. The females just have antennae. The picture above is a female. We need to do more research in order to find a species match for the tail structure. We also need to collect water samples to get copepods from different places, though it may be too cold at this time of year to catch them.